I like that Chronodex allows you to think in a cycle, but at some points when I was using it, I left like it was never-ending, and I would carry my work over into the night. When I was using the linear day planning method, I was able to block out sections and there wouldn’t be an overlap anywhere. If you have a look at the pink and orange coloured areas, this is where the AM and PM overlaps in the Chronodex. It’s probably just purely a psychological thing for me, and the fact that it was a very time-demanding workplace. I also found that, as my workload increased, I would carry over onto three or four pages of bullet journalling. Hence why I’ve carved up most of my notebook already! In saying this though, I also found that I can’t forward plan as quickly and efficiently (trust me, there have been a few appointments I’ve missed), and I’ve have to block out sections in my week to set my Chronodex up for the week and carry over all migrated items and follow-up appointments. It has, at times, been very messy. 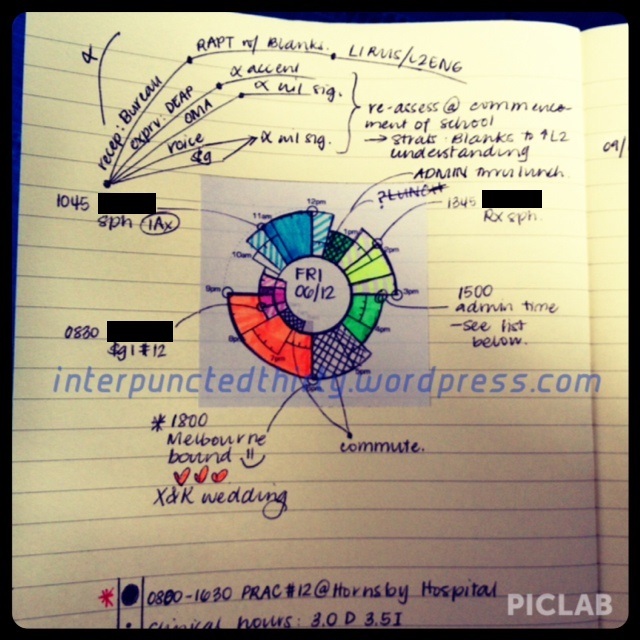 For the Chronodex section, I block out the sections, colour it using a highlighter (or whatever was available at the paediatric clinic, like a crayon or texta/marker), then write the time, client/patient name, reason for appointment and whether it is an initial assessment (IAx) or therapy (Rx) – e.g. 1045 [name] sph, IAx. The coloured hatching on either side is my admin and prepping time for each client/patient. 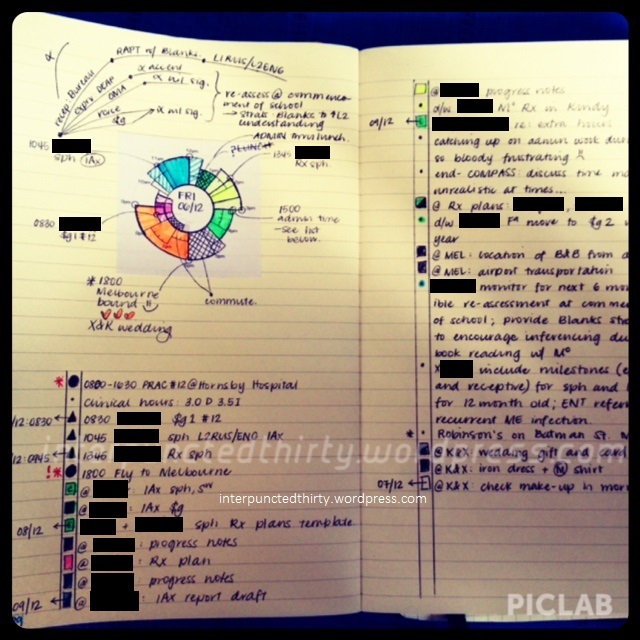 Every bullet point that is related to a section in the Chronodex is colour-coded accordingly. For example, for the green coloured parts, this is my admin time, and in this block, I want to accomplish all the highlighted bullets below, which are mainly phone calls and emails. All work-related bullet points are colour-coded, everything else (i.e. personal tasks, etc.) is left as is. I also use an arrow (i.e. 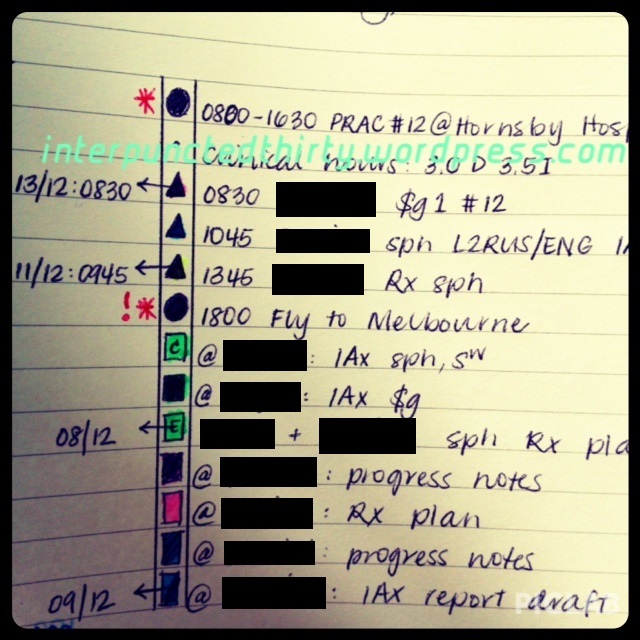 bullet journal’s ‘migrated’ symbol) and place the date of the client’s/patient’s next appointment in the margin, e.g. 11/12:0945 means 11th December at 9.45am. And that, my lovely planning friends, is how I have incorporated Chronodex with bullet journalling. I would love to continue with this method, but I’m not sure how sustainable it is. If anyone in the bloggersphere has any suggestions for day planning that can easily be integrated with bullet journalling, please feel free to comment/email away, I would really appreciate some advice! I would like to know: What has worked/failed? What have you adapted/altered? Is it sustainable? I invented the daydex that you can find on my personal site. feel welcome to try one of the version. Today you can find two new Daydex, one per Two pages with different style for midori Travelers Notebook. But you can easy copy the style by pen on your lovely moleskine ;-) you can find it here: mylasteureka.blogspot.de free welcome to come with your advise. Another time, thank you for sharing your experiment with the bullet journal! I printed the full Chronodex Weekly Planner, folded it an stapled it to look like a check register booklet, and I slid it into the elastic closure on my moleskine bullet journal. I have a page a day for bullet journaling, and I use my Chronodex as a schedule, and my bullet journal as a to-do list/journal/whatever.